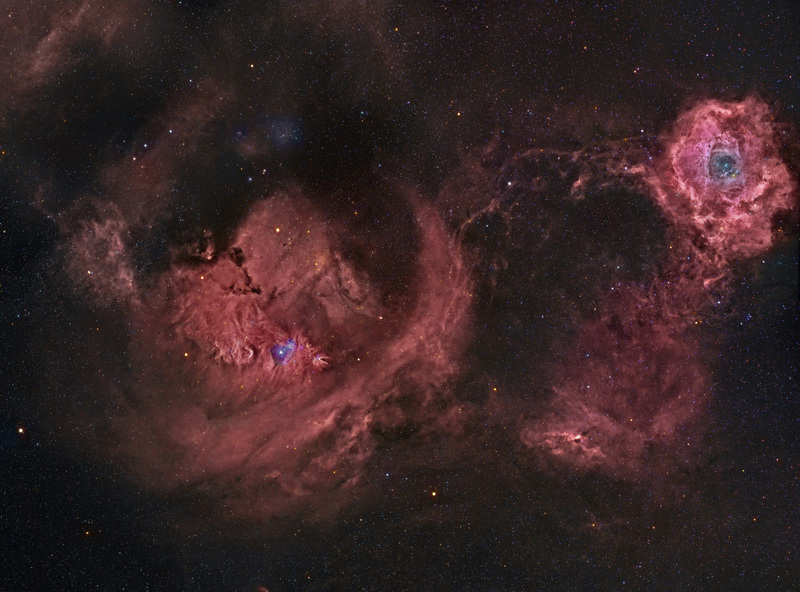 This project started as a H-Alpha 2x2 mosaic of the Rosette and Cone nebulas in Monoceros. The top-left pane was taken during full Moon (23 degrees away from this field). You can see the H-Alpha image only here. After having the Ha, I was hoping to gather LRGB to make a color image, however I could only squeeze one night for RGB before bad weather arrived, and on that night, I only had about 3 hours before the Moon would show up that night, so the only way I thought I could gather some color that I could use was by using my Canon 40D and a camera lens, and that's how I've got the color (18x10'). Not enough time to get separate RGBs and luminance, much less for a 2x2 mosaic. Since the color data was so bad compared to the Ha, rather than combining the Ha with the RGB and getting a luminance out of that, I used the Ha as luminance - something often not recommended - then did some needed heavy surgical work to the RGB image and added it over the Ha-based-luminance, which not only created the expected salmon salad effect but also generated undesirable color blotch and other artifacts. A "cherry red" version of this image was selected as NASA's Astronomy Picture of the Day on February 14th, 2010.